Lady Commandant of the First Aid Nursing Yeomanry | Flickr - Photo Sharing! 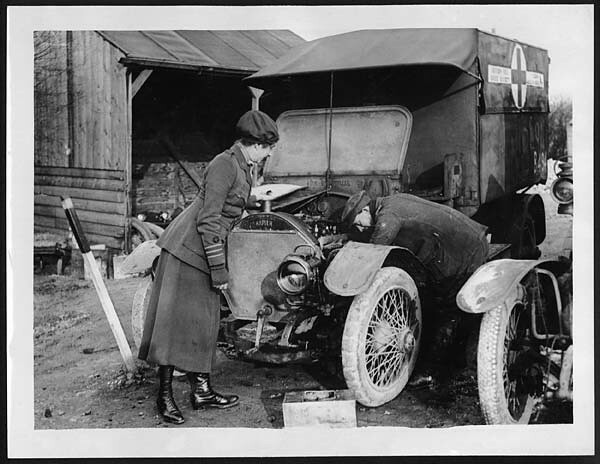 According to this photographs original caption, the woman shown here watching the mechanic fixing an ambulance, is a Commandant in the First Aid Nursing Yeomanry (FANY). The metal nameplate at the top of the ambulances radiator shows the company name, Napier. At this time, the Napier Engineering Company (formed from D. Napier & Son) was a leading British manufacturer of automobile and aircraft engines. Established by Kitchener in 1907, the First Aid Nursing Yeomanry performed a wide range of front line duties including driving, nursing and cooking. The original purpose in setting up this organisation was to improve the care of wounded soldiers as they were moved from the front line to the military field hospitals. As they had to serve in forward areas, a number of women who worked for this organisation during the conflict lost their lives. It is interesting to note just how many famous authors worked as ambulance drivers during World War I. The roll of honour includes such famous writers as Ernest Hemingway, Somerset Maugham, E.E. Cummings, John Masefield and Charles Nordhoff. Hemingway certainly used his war experiences when writing the novel, 'A Farewell to Arms.' Gertrude Stein and E.M. Forster also performed voluntary medical duties during the conflict. StoryVault, cherchezlafemmeus, MsWord, and 11 other people added this photo to their favorites. Her name is Lilian Franklin. Please add. That is correct. Lilian Franklin was my Great, Great Aunt, very brave...."The Boss"